Dignity Health Sports Park, formerly the Home Depot Center and StubHub Center, is a multiple-use sports complex located on the campus of California State University, Dominguez Hills in Carson, California that consists of a soccer stadium, a separate tennis stadium, a track and field facility, and a velodrome: VELO Sports Center. 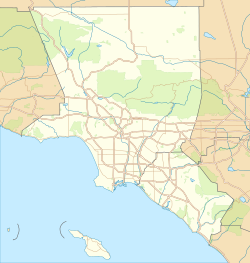 It is approximately fourteen miles (23 km) south of downtown Los Angeles and its primary tenant is the LA Galaxy of Major League Soccer (MLS). It is also the temporary home of the Los Angeles Chargers of the National Football League (NFL). Opened in 2003, the $150 million complex was developed and is operated by the Anschutz Entertainment Group. With a seating capacity of 27,000, it is the largest soccer-specific stadium in the U.S. and the second-largest among its kind in MLS, after Canadian Toronto FC's BMO Field. In addition to hosting LA Galaxy games since its opening, the stadium also served as the home of the now-defunct Chivas USA MLS team from 2005 to 2014. The stadium became the temporary home of the Los Angeles Chargers beginning in 2017 – making it the smallest NFL stadium – until the completion of the Los Angeles Stadium at Hollywood Park in 2020, which they will then share with the Los Angeles Rams. During the 2018 Los Angeles Chargers season, while the Chargers played in the stadium, the facility was named ROKiT Field at StubHub Center; ROKiT's naming rights to the football field are part of a "multi-year" agreement. During its first decade, the stadium's sponsor was hardware retailer The Home Depot. In 2013, the title sponsor became the online ticket marketplace StubHub. In 2019, the name sponsor became healthcare provider Dignity Health. Originally opened as the "Home Depot Center" in 2003, it was renamed "StubHub Center" on June 1, 2013. It was renamed "Dignity Health Sports Park" on January 1, 2019, after Dignity Health signed a new naming rights agreement. The 27,000-seat main stadium was the second American sports arena designed specifically for soccer in the MLS era. 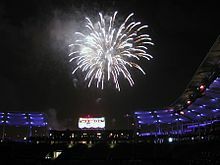 When the venue opened in June 2003 as the new home of LA Galaxy, a number of special events took place in celebration. Pelé was in attendance at the opening match along with many dignitaries from the soccer world and other celebrities. In addition to the soccer stadium, Dignity Health Sports Park features the 2,450-seat VELO Sports Center (velodrome), an 8,000-seat tennis stadium. and an outdoor track and field facility that has 2,000 permanent seats and is expandable to 20,000. Soccer stadium building costs within the $150 million complex were around $87 million. In 2017, to accommodate the Chargers' use of the stadium, upgrades were made at cost to the Chargers including bleachers in the second deck on the east side of the stadium being replaced by tip-up seats and moved to the berm on the north side, adding 1,000 seats. A new section of upper-level bleachers, which seat 330, were erected in the southeast corner of the stadium. Also, the luxury suites were renovated with new seats, furniture, community tables, and engineered hardwood floors and the press box underwent an upgrade with a third row added to the main box, boosting capacity from about 35 to 53. Floors were constructed on the roof of the luxury suites so an auxiliary press box could be built on both sides of the main box. Two new radio booths were built outside the south side of the press box, and a large new booth on the north side which serves as a security command post for police and NFL officials was constructed. Two booths were added on each side of the press box for the NFL-mandated 20-yard-line television cameras, and a stairway allowing access to the roof of the main box was built to accommodate the 50-yard-line camera. To accommodate 53-man NFL rosters, four small locker rooms were converted to two larger ones with 60 cubicles in each. Also added were small postgame news conference rooms for each team and rooms for game officials and the chain gang. Aside from being home to the LA Galaxy of Major League Soccer, it was also home to two defunct clubs, the MLS team Chivas USA as well as Los Angeles Sol of the Women's Professional Soccer. The stadium hosted the 2003 MLS All-Star Game and the MLS Cup in 2003, 2004, 2008, 2011, 2012 and 2014. Dignity Health Sports Park was also the site of the 2003 FIFA Women's World Cup final. Both the United States women's and men's national soccer teams often use the facility for training camps and select home matches. It also hosted the 2004 NCAA Men's College Cup, with Duke, Indiana, Maryland, and UC Santa Barbara qualifying. The track and field stadium on the site is also home to the LA Galaxy II of the United Soccer League, farm club to the parent Galaxy. On July 30, 2016, it hosted a 2016 International Champions Cup match between Paris Saint-Germain and Leicester City. Paris Saint-Germain won the match 4–0 to complete a perfect record in the ICC. The stadium hosted the first three editions (2004–06) of the USA Sevens, an annual international rugby sevens competition that is part of the IRB Sevens World Series. The stadium has also hosted all United States national team matches for the Pacific Nations Cup since 2013. It was also the location for the State Championship Bowl Games for high school football teams in the state of California from 2006 to 2014. The Semper Fidelis All America game was held there on January 5, 2014, featuring an East vs West high school matchup. 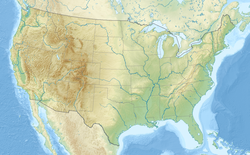 The first college football game was held at the stadium on January 21, 2012, as the AstroTurf NFLPA Collegiate Bowl, with the National Team beating the American Team 20–14. The track played host to the 2005 USA Outdoor Track and Field Championships. It is also the home of the Adidas Running Club, a member of the USA Elite Running Circuit, and the Adidas Track Classic. Dignity Health Sports Park is also home to Athletes' Performance which trains athletes in a variety of sports. The Los Angeles Riptide of Major League Lacrosse played their home games at the track and field stadium. The soccer and tennis stadiums of the Center have also served as the main venues for ESPN's Summer X Games. From 2010 to 2016, it hosted the Reebok CrossFit Games. Initially only utilizing the tennis stadium, over the years it also expanded to the running field and the soccer stadium. The facility has also hosted several high-profile professional boxing matches, including Andre Ward vs. Arthur Abraham, Brandon Ríos vs. Urbano Antillón, Shawn Porter vs. Kell Brook and matches featuring other notable fighters. The venue has become iconic among boxing fans for its electric atmosphere. On August 16, 2013, Resurrection Fighting Alliance held an MMA event RFA 9: Curran vs. Munhoz with the main event crowning a new Bantamweight Champion. The Los Angeles Chargers began their three-year tenure at Dignity Health Sports Park in the 2017 NFL season, while the Los Angeles Stadium at Hollywood Park in Inglewood is being built. During the 2028 Summer Olympics, the venue will host rugby, tennis, modern pentathlon, field hockey, and track cycling. The Vans Warped Tour was held annually in the stadium parking lot until the tour’s final year in 2018. It also served as the host facility for the first two seasons of Spike TV's Pros vs Joes reality sports contests. In 2007 it received the bands Héroes del Silencio, in their Tour 2007, and Soda Stereo in their Me Verás Volver tour 2007. The facility is often used to provide a stadium background in film, television and advertising. Dignity Health Sports Park is located south of the Avalon Boulevard exit on California State Route 91. In 2017, the LA Galaxy launched a shuttle bus service with two routes connecting Dignity Health Sports Park with the Harbor Gateway Transit Center and Del Amo station, operated by Long Beach Transit. ^ "Dignity Health Sports Park". LA Galaxy. February 23, 2012. Retrieved January 6, 2019. ^ Kirk, Jason (January 12, 2017). "Los Angeles Chargers' 2017 stadium would be the 108th-biggest in college football". SB Nation. Retrieved February 25, 2017. ^ "Five Questions with Shaun Ilten, Manager of Turf & Grounds at StubHub Center - SportsField Management". www.sportsfieldmanagementmagazine.com. Retrieved August 14, 2017. ^ "Crew home opener: 24 days and coming – OurSports Central – Independent and Minor League Sports News". OurSports Central. March 10, 2004. Retrieved September 2, 2012. ^ "JAMA // Home Depot Center". Johnmartin.com. Archived from the original on April 2, 2012. Retrieved September 2, 2012. ^ "Project list from both AG Engineering Group, Inc". Agengineeringgroup.com. Retrieved September 2, 2012. ^ "Construction Services |PCL". Services.pcl.com. Archived from the original on April 3, 2012. Retrieved September 2, 2012. ^ Bell, Jack (August 9, 2005). "Life Was a Beach for Chivas Striker". The New York Times. Retrieved August 10, 2005. ^ "Dignity Health Sports Park". California State University, Dominguez Hills. Retrieved January 6, 2019. ^ "StubHub Begins Transition as New Naming Rights Partner to The Home of the MLS Champion LA Galaxy & Chivas USA". Anschutz Entertainment Group. May 31, 2013. Retrieved February 25, 2017. ^ "Home Depot Center to be renamed StubHub Center in June". Major League Soccer. March 4, 2013. ^ "AEG announces new partnership with Dignity Health, renames LA Galaxy home stadium Dignity Health Sports Park". Dignity Health Sports Park. December 13, 2018. Retrieved January 1, 2019. ^ Koren, James Rufus (December 13, 2018). "Hospital chain Dignity Health buys naming rights to Carson's StubHub Center". Los Angeles Times. ^ "LA Galaxy's StubHub Center To Undergo A Name Change". KCBS-TV/KCAL-TV. December 13, 2018. Retrieved January 1, 2019. ^ "Venues". Dignity Health Sports Park. Retrieved January 6, 2019. ^ "Sign-In Form". portlandonline.com. Retrieved February 24, 2015. ^ "Page Not Found - Los Angeles Times". Retrieved August 14, 2017. ^ "StubHub Center selected as MLS Cup 2011 host". MLS Soccer. May 9, 2011. Retrieved May 10, 2011. ^ "Astroturf-NFLPA-Collegiate-Bowl-Announced / News". NFLPlayers.com. Retrieved September 2, 2012. ^ "Games Tickets in 2015". CrossFit Games. Retrieved May 5, 2016. ^ "Superfly: Gonzalez v Rungvisai II heads to Stubhub Center, tickets set to go on sale". July 6, 2017. ^ "Chargers to Relocate to Los Angeles". San Diego Chargers. January 12, 2017. Retrieved February 25, 2017. ^ "StubHub Center named interim home of Los Angeles Chargers". Anschutz Entertainment Group. January 12, 2017. Retrieved January 1, 2019. ^ Schrotenboer, Brent (January 12, 2017). "Chargers plan to play in smallest 'NFL stadium' for next two seasons". USA Today. Retrieved February 25, 2017. ^ Green, Nick (March 15, 2017). "Free Galaxy shuttle cures StubHub Center traffic woes". Orange County Register. Retrieved August 10, 2017. 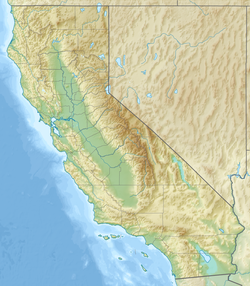 Wikimedia Commons has media related to Dignity Health Sports Park.